Manufacturer of the patented interlocking aluminum cover. 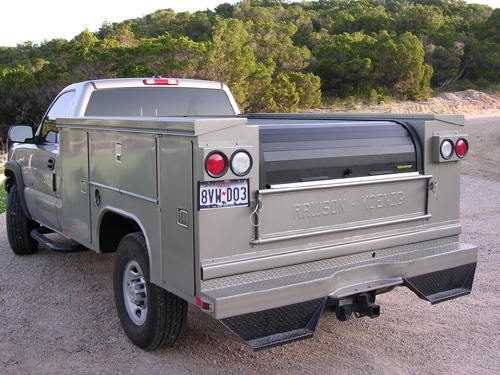 We specialize in building retractable truck bed covers that are designed especially for service bodies. Our system is rigid, self-storing, lockable, and very compact, allowing complete access to the entire bed area. There is simply no other treatment available for service bodies that can offer the ease of operation and versatility of a Rollcover. Rollcover manufactures retractable covers that are made to order per your specifications. Our staff is experienced in both custom fabrication and installation. We have applications for most standard sizes, and if necessary can work with you in developing special solutions for bodies up to five and a half feet in width and thirteen feet in length. If you are looking for an effective way to cover and secure the bed area of service bodies, you need to consider Rollcover.